Each week seems to bring a new legal attack against one of my favorite foods. I’ve written about Nutella and donuts (yummm) on this blog before. Now it’s Fruit Roll-Ups® and Fruit by the Foot® – the chewy, fruity, delicious snacks made by General Mills (Reuters). Plaintiffs in the Northern District Court of California allege that General Mills falsely promoted these two snacks as “nutritious, healthful to consume, and better than similar fruit snacks.” (see complaint here) If General Mills is found guilty of this claim, it would send a huge shock through the food advertising world. 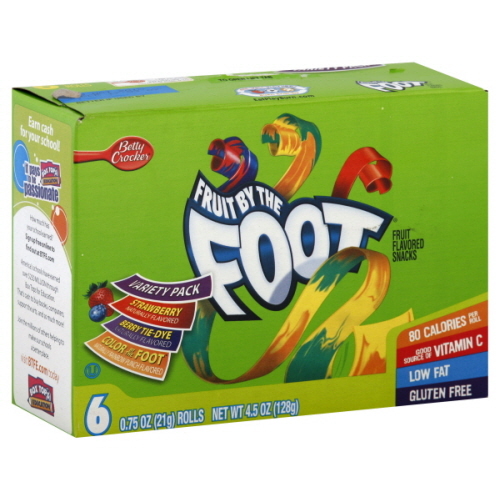 The plaintiffs (the class is represented by Reese Richman LLP and the Center For Science in the Public Interest) express their chief complaints through a picture of the Fruit by the Foot® box. As can be seen above, the box claims that the product is “80 calories; A good source of Vitamin C; Low Fat; and Gluten Free.” Plaintiffs do not contend that any of these statements are false. Rather, plaintiffs allege that these statements leave consumers with the “impression” that the product is healthy. But, plaintiffs argue, the product is not healthy because it is high in sugar and has some trans fats, which, as the complaint notes in great detail, are very unhealthful. This logic is troubling. Allow me to analogize by way of a dating profile. If I say that I’m tall – one of the characteristics that often describes attractive men – it doesn’t mean that I said I’m attractive. Therefore, it would be unfair if a viewer of my profile claimed that I wasn’t attractive and then sued me for false advertising. Similarly, although the Fruit by the Foot® box makes claims that are often part of healthy products (low calories, low fat, etc. ), this is not the same as claiming the product is healthy. The complaint alleges no facts that show General Mills explicitly stated that these products are “very healthy” or “good substitutes for fresh fruit and bananas” (e.g.). Neither an exhaustive Google search nor discussions with some of the parties involved turned up any examples of General Mills explicitly touting the healthy benefits of the products. Therefore, General Mills should not be sued for falsely claiming something that it never actually claimed. Should this lawsuit find success, it will have widespread ramifications. The first affected industry that comes to mind is nutrition bars. Consider, just as an example, the Pure Protein Peanut Marshmallow Eclipse bar. It advertises that it has 29 grams of protein and only 3 grams of sugar – two very nutritional positive facts. The bar, however, also has 30 percent of recommend daily saturated fat – something that another person might conceivably consider unhealthful. Does this mean the company can be sued for false advertising? Again, this would seem illogical. It looks like a battle is upon us, and it’s one worth following because it could have huge implications for the world of food advertising.